At Phoenix Explorers, we are part of Hampshire Scouts and this year, Hampshire Scouts celebrates its 110th birthday. During this celebratory year, Hampshire Scouts have made an Occasional Badge to help members of Scouting celebrate and remember the occasion. I still have a badge that I was awarded to celebrate 80 years of Cub Scouts when I was a young person in Cubs! The badge is available to everyone from Beavers all the way up to adults but it has to be earned. At Phoenix Explorers, we are aiming to work through the requirements for the badge so that we can proudly wear it for our St. George’s Day service in Basingstoke. Over the course of this term, we have a number of activities planned to help us along the way such as an investiture ceremony to complete our Unit Activity and a night of games and activities focused on YouShape, an initiative that happens every year to encourage and promote the youth-led organisation of Scouting – more on this to follow. Each activity from the activity list for the badge has a points sum. Build up 110 points across four different activity areas and you earn the badge. Our Explorer Scouts that attended Gilwell Wintercamp last weekend are lucky enough to have grabbed a bunch of points as one of the activities is to visit Gilwell Park! We’re looking forward to working on these activities and being able to award the badges to our Explorers. As an Occasional Badge, we can then wear the badge on our uniforms for the remainder of 2019. After 2019, add it to your camp blanket to show that you were a part of Scouting during such a special year. 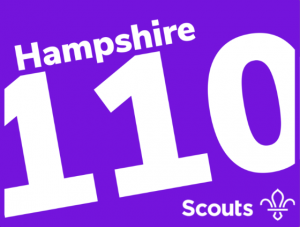 If you want to find out more about Hampshire 110, some of the activities, and the badge requirements, you can visit the micro-site by Hampshire Scouts at http://thescouts.xyz/. This entry was posted in Programme and tagged birthday, Gilwell Park, Hampshire Scouts, occasional badge. Bookmark the permalink.